Hosting a small to large business event just got easier and more affordable. 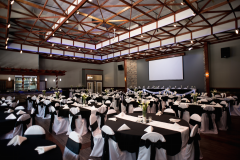 We provide flexible meeting rooms and event space, professional event planning services and multiple catering options for the perfect event. We offer a variety of professionally prepared meals and refreshments for a low, per-person fee. We’re also happy to accommodate attendees with special dietary requirements. Everything from breakfast, lunch and dinner, plus everything between like delicious desserts and a full bar. Enjoy a full drink menu with exceptional service. Choose from a cash bar, open bar, or anything in between…it’s all yours. Need a room with Internet capabilities and videoconferencing? If you’re looking for advanced technology, reliability, and convenience, you’ve come to the right place. Our 30,000 square foot indoor entertainment center has something for everyone. With everything from Laser Tag, to Paintball, to tons of state-of-the-art arcade games, you and your guests will be entertained throughout the evening. Add a Sports Bar and Riverside Tiki Bar and you have the perfect combination for fun. For more information call (608) 783-3335, email us or submit your inquiry online.